E-Cigarettes, A Gateway to Nicotine Addiction? The cigarette industry as whole is increasingly becoming less desirable while electronic nicotine devices are becoming more popular. Though full impact on health is not yet known, electronic cigarettes are poised to continue to expand their market and are gaining the attention of younger consumers in particular. Electronic cigarettes are quickly capturing market share in the $100 billion U.S. tobacco industry, with sales projected to top $2 billion this year. Momentum for this category is impressive, particularly when considering that electronic cigarettes accounted for zero percent of the market less than a decade ago (Esterl). First introduced in the U.S. in 2007, electronic cigarettes were perceived mainly as a method to break the addiction to smoking. However, rather than being utilized only for smoking cessation, smokers and product manufacturers have since turned to the devices as a direct replacement for cigarettes. Electronic vaporizers, also known as vape devices, didn’t really gain traction up till near end of 2009, when the users started to embrace the device’s versatility for smoking both indoors and outdoors, with little to no odor. 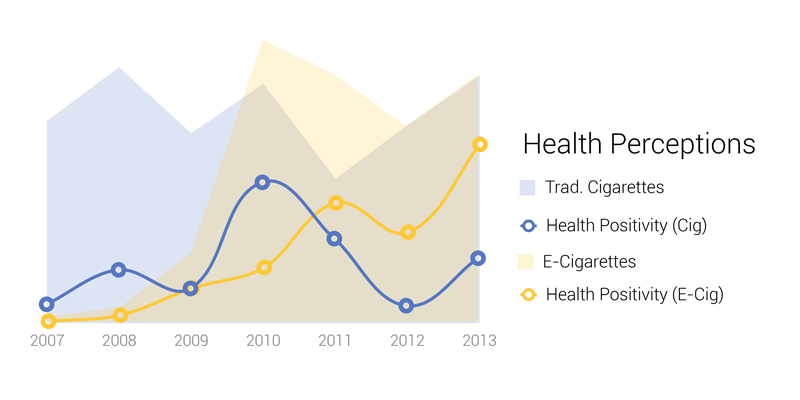 The health perceptions over the past 7 years have also been increasingly more positive with electronic cigarettes than with traditional cigarettes. Recently published in the American Heart Association’s (AHA) journal, Circulation, showed that recent studies are raising concerns that electronic cigarettes could be a gateway product for the nation’s youth to latch onto traditional tobacco products sooner. The overall positivity in a broad sense, supports AHA’s study in the growing interest of electronic cigarettes compared to traditional cigarettes. Over the past 4 years, traditional cigarettes were most popular amongst consumers under the age of 24. This changed in 2013, when a notable shift towards e-cigarettes occurred. 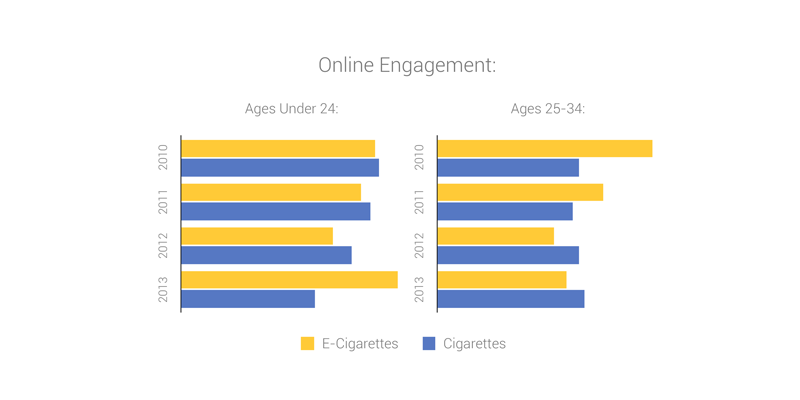 Millennials, ages 25 to 34, initially showed higher engagement during the earlier years for e-cigarettes but more recently have gravitated towards traditional cigarettes instead. 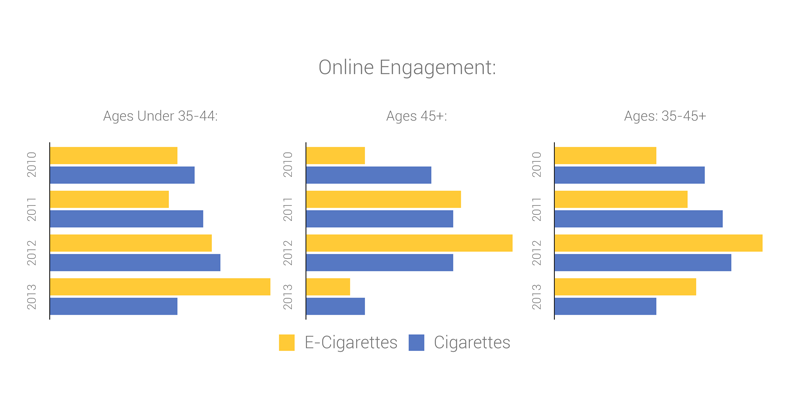 Consumers aged 35 to 44 have become increasingly more interested in e-cigarettes. Although consumers aged 45 and up were open to embracing the new trend during the earlier years, this group has since seemed to revert their intrigue back to conventional preferences instead. Overall, consumer preference shifts, especially by early millennials and mid-ranged consumers, show that the cigarette industry is becoming more fragmented and less focused on traditional tobacco products. There are ten major players in the e-cigarette market. 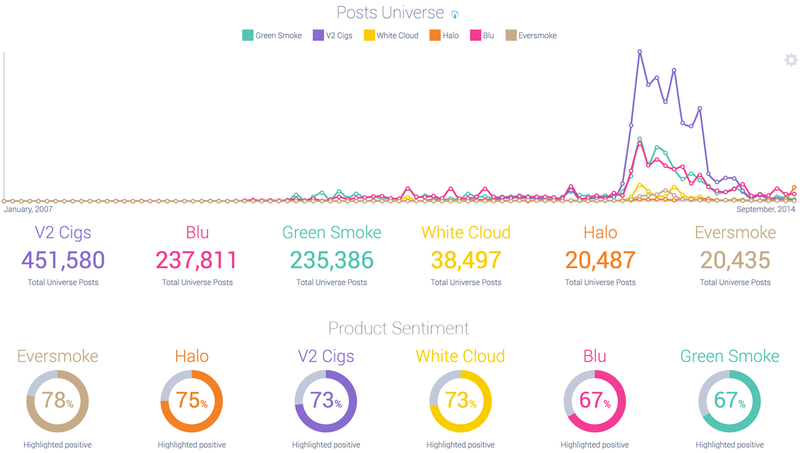 Of those ten, six are consistently discussed online, including: V2 Cigs, Blu, Green Smoke, White Cloud, Halo, and Eversmoke. 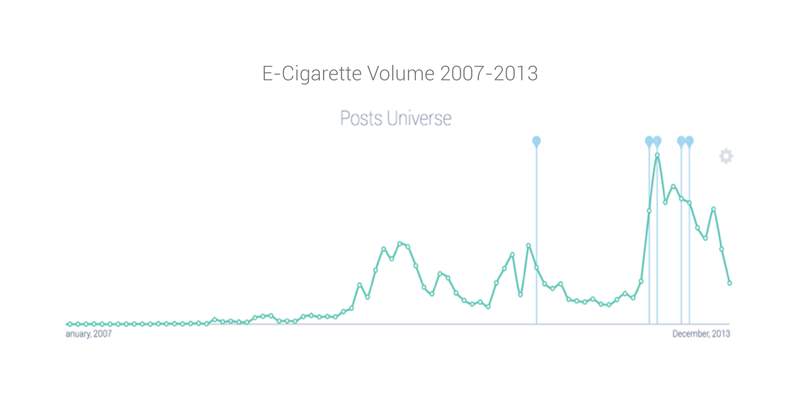 Observing the trend line of social mentions from 2007 through 2014, the Green Smoke and Blu brands were the first to start generating attention. 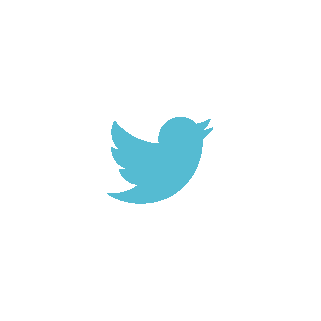 It wasn’t until 2013 that brands really began seeing traction online. 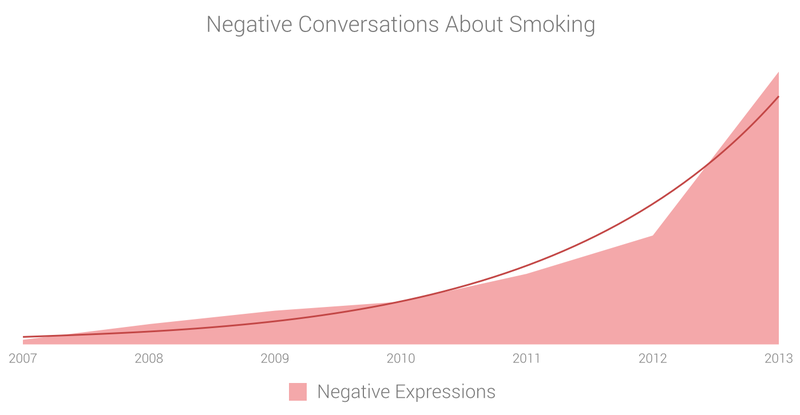 V2 Cigs in particular generated the most attention during 2013, however, like all other e-cigarette brands, total conversations have drastically decreased in 2014. 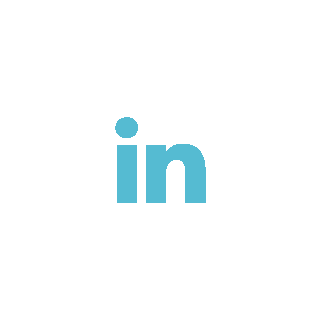 Based on online conversation data, it is projected that interest in electronic cigarettes will decline significantly with millennials, while younger consumers will generate the highest interest by 2016. The cigarette industry overall can expect to still drive enthusiasm in consumers under the age of 45, but should expect to lose a significant amount of attention from consumers older than 45. One observation that deserves notice is that the cigarette industry as a whole is taking a slight dive. Millennials and those 55 years or older are talking less about cigarettes online today than they were just 3+ years ago. With the tobacco industry being saturated with different alternatives, one would likely wonder, will electronic cigarettes be the new dominating force in the industry? Very likely, yes. But will the cigarette industry as a whole, hold a higher presence with consumers in the future? Conversations online about cigarettes now say otherwise. 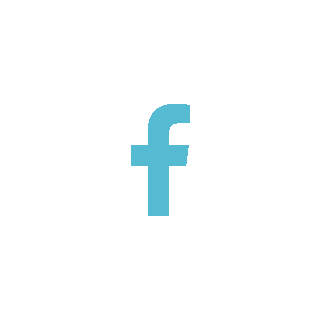 People online have expressed negative sentiment around the topic of smoking cigarettes, and can be expected to continue to be increasingly negative in years to come. The industry is losing its smoke and the consistency of its current presence is certainly giving the industry a diminishing outlook.